A flat marker that needs annual maintenance. It becomes in danger of becoming overgrown. Use signs to inform visitors of regulations and efforts of a local group to protect this historic place. When possible, lighting helps to deter vandals and unwanted night time loiterers. Provide trash receptacles and have them emptied regularly. Provide some benches to invite local citizens to enjoy your cemetery and treat it with respect. 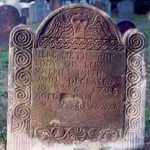 Have tours and place information about your cemetery in local libraries and schools. Don’t mow immediately around the stone or use nylon whip weed-whackers. You can often see scars on old stones that have suffered from these methods. Perhaps if you can equip the mower with a rubber guard it would help. Don’t use commercial herbicides around stones. Even if your product is environmentally safe, the stone can wick up the chemical from the ground and, mixed with its own salts, can cause corrosive reactions. This is a prime example of poorly planned maintenance; this shallow shelf has caused severe erosion and helped also by contact with the blade of an earth mover. 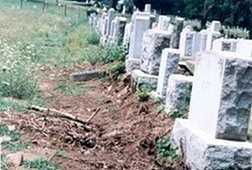 The opposite photo shows and expanse that was believed to not hold any graves, so thought the workers driving over it. Consider replacing weedy overgrowth with close lying ground covers (another way to eliminate mowing around stones). Crushed stone is another option but take into the consideration the visibility and historic integrity of your burial ground or cemetery. This is an excellent fix for those family cemeteries that are off the beaten track where a lawn mower would never go anyway. 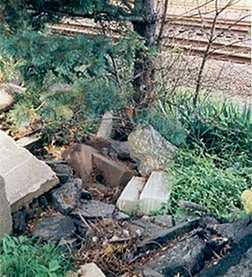 Remove scrub trees and prune shrubs to prevent damage to stones. Large trees that should also be addressed, especially if they have large broken limbs or are diseased and could fall onto your gravemarkers causing damage. 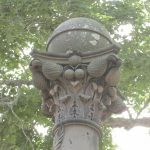 In some area’s like Connecticut we have laws that need be considered when taking on projects of this nature, as C.G.S. Section 19a-315a et seq. 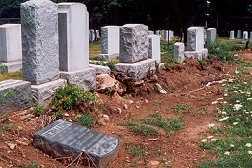 which addresses rehabilitating an old burial ground, and this includes fences and curbing. 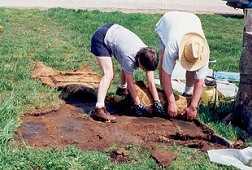 The cemetery and the crew was unaware that the area being excavated contained old, poorly documented gravesites. 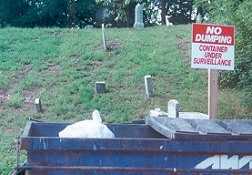 Here’s one of our least favorites issues: Concern about the dumpster being under surveillance, but no one paying attention to the encroachment on the adjacent cemetery. A gross misuse of of old cemetery gravestones. Here, they were used as “pavers” to create a driveway in the cemetery! In photo at the left, volunteers are taking them up to be put back in their rightful place. Busy railroad tracks next to an existing cemetery… poorly kept areas and in a state of disrepair.